The use of Posidonia oceanica in building construction should be done with the greatest caution and their use should be limited only to areas where accumulation on beaches exceeds the amount necessary to maintain the balance of the coastal dune ecosystem. The extraction should always be done by regional or state agencies that manage this heritage, in compliance with protocols and regulations, and never by individuals or private companies. On the beach, diggers controlled by the technicians of the Environment Council of Formentera will supply the Neptun grass to trucks that will transport it to the site of the works. 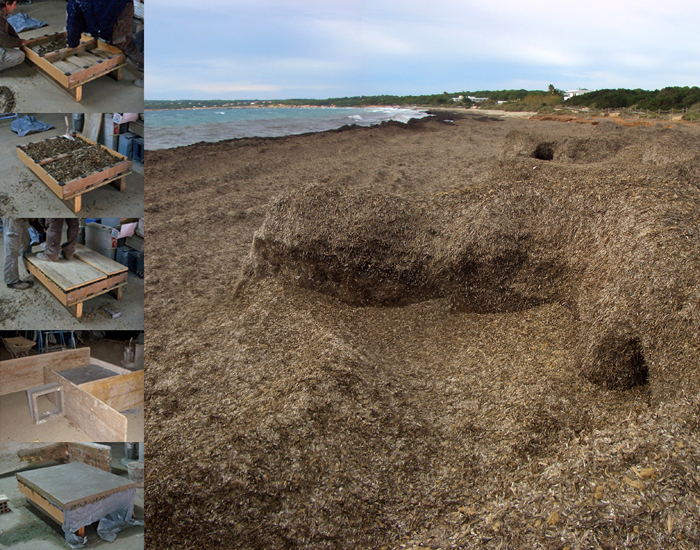 This project complies with all protocols to avoid the environmental impact of collecting the Neptun grass on beaches, as indicated in the authorization by the Consellera de Medi Ambient d’Indústria i Energia de Formentera, which is part of the management program of the Department of the Environment Council of Formentera, as it can be seen at the documents “Authorization for using Posidonia oceanica waste and pallets as a building material” dated November the 10th, 2010, and at the “Report about the management of Posidonia oceanica at Formentera beaches”, dated August the 13th, 2012, which are attached below. 1. Neptun grass do not require any artificial treatment since sea salt acts as a preservative and biocide. 2. The Neptun grass will get dry during July and August 2014, using the downtime specified at the Formentera regulations. It requires to be extended in thin layers, between 5 and 10mm, exposed under the sun for a full day. Once dried, it will be stored in a dry place protected from rain and moisture to be used. 3. To begin the insulation process, it should be finished the upper framework, including the placement of reused pallets upside to receive the Neptun grass. These pallets are placed on the lightweight concrete content by a waterproof sheet. 4. The Neptun grass must be compacted manually inside the pallets, reaching a 300Kg/m³ density. 5. During the roof construction, at the end of the working day, the compacted area will be covered with plastic (polyethylene), in order to protect from dew, wind and rain. 6. Once compaction is done, wooden boards OSB-III will be nailed to the pallet framework with galvanized bolts. A geotextile layer will be extended to protect the EPDM waterproof sheet, which is fixed only on the sides and glued to the first layer of waterproof polyethylene (under the concrete layer). The union of the bottom sheet of polyethylene and upper EPDM ensure the tightness of the camera, thus maintaining constant moisture conditions of dried seagrass as insulation. Therefore, the proper functioning of the system depends on the perfect seal between sheets.